In one of the more Jalopnik museum exhibitions in recent memory, Chicago's Museum of Contemporary Arts is featuring both Dymaxion creator Buckminster Fuller and icy BMW car artist Olafur Eliasson. There are few 20th century visionaries quite as cool as Buckminster Fuller, if only for the Dymaxion car. 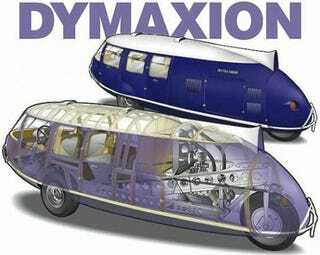 In what can be considered the first minivan, the Dymaxion got 30 MPG, could seat 11 and hit a top speed of 120 MPH. It did all of this in 1933. The MCA doesn't have a copy, sadly, but it does have numerous early drawings and other Dymaxion-related goodness. Olafur Eliasson is the most recent BMW car artist but, rather than repainting an existing model in his own style, he took one of BMW's H2 racers and re-skinned it with reflective metal and frozen water. Though the car itself isn't around, numerous other object creations from Eliasson are on display, including the 360-degree changing color room. As one of the most influential artists of the day, these works impact the design of everything from furniture to new cars.